Whoever thought cramming neural networks and networking into one subject… anyway I decided to focus on networking more than AI for this subject. I decided networking would be more useful down the track, and in the end only you can teach yourself AI, if that makes sense. With networking we used RakNet in OpenGL, I created a server with 2 clients who play a game together, where they direct a line of ants to food and back to their nest while avoiding danger. One player can place blocks to stop the ants walking into water (the danger) while the other player can direct where the ants go. I have basic AI – as in, I learnt it in first year – that allows the ants to wander and follow in a line when not being directed, then seek the direction once it is provided. 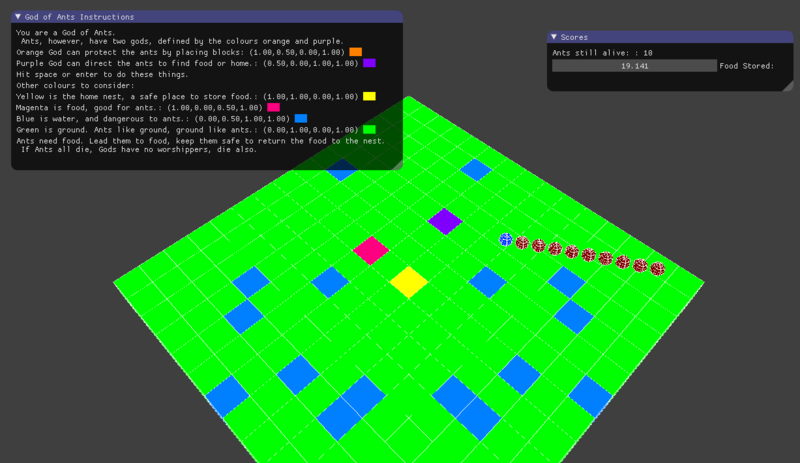 The game is a simple OpenGL set up with coloured cubes for the ground and spheres for the ants. The assignment didn’t require a graphics component so I kept it simple. Update: after falling ill just before this was due, I was able to get an extension and finally get it marked off as complete! Phew.